No parent ever wants to hear a doctor share this diagnosis. Yet, this is what my wife and I were told just over a month ago when we learned that our 16-year-old son Zachary had Hodgkin’s lymphoma, a cancer of the lymphatic system. Heartened by the good prognosis, we set out on a journey of healing with our son Zachary that is very familiar to anyone who has lived through chemotherapy with a friend or family member. Zachary is about to begin the second of five cycles of chemo, which ought to last until early December. He will then have three weeks of radiation treatments. Barring any complications or infections, Zack may be cancer free by January. This gift requires a measure of vulnerability and submission. Vulnerability to let others know that you are struggling with illness, as your life, with its habits and routines, has been altered. Submission in the sense that you must be willing to relinquish control and accept help from others. In doing so, you develop a profound sense of gratitude that can then in turn be drawn on to help others in the future. My wife, Mary Beth, and I have long been candid about our own and our family’s struggles with mental illness. So when Zack was diagnosed with cancer, we felt comfortable informing family of the news and posting the prognosis on Facebook. What has occurred after the disclosure of this information has been remarkable. Family, friends, colleagues and relative strangers have mobilized to offer support in a variety of ways. My sister-in-law, Katie, set up an online page where people have signed up to bring meals to our home. 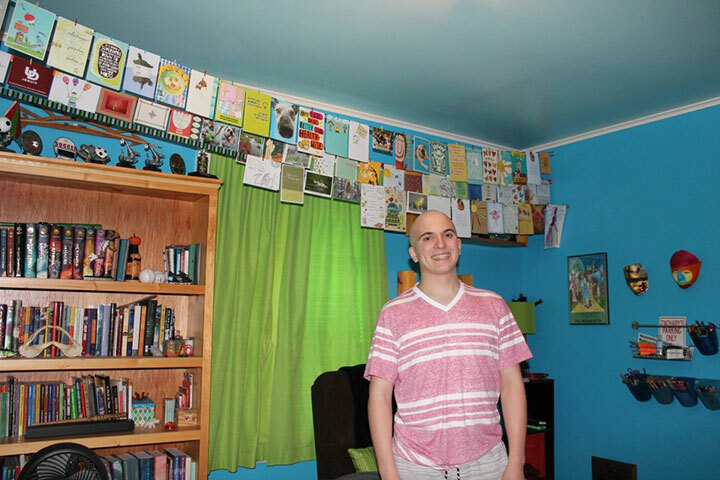 Zack began to receive cards and care packages from near and far. We have had thousands of well-wishes and prayers from all sides. When Zack finally returned to school after missing the first three weeks of class, he attended a pep rally where the entire school gave him a standing ovation as the president of the student government presented him with game balls signed by both the soccer and football teams. We have never felt the power of such prolonged, concentrated kindness before. It took an illness on the magnitude of cancer for us to palpably realize just how loved we are. The awareness of this force and the support that it engenders is the power of accepting help – empathy in action. We asked for help, and we continue to receive it. This is profound, moving, and will ultimately contribute most to Zachary’s recovery and lifelong sense of well-being. Most importantly, the receipt of this positive energy compels us to pay it forward, to give to others who are also in need. We are more sensitive than ever to the generative power of helping others. As an educator, I am constantly aware of the importance of cultivating communities of care. As I live this journey with Zack, I notice people who could use some extra help. This is consistent with the first component of my platform as Michigan Teacher of the Year – equity. I am more sensitive to folks who may need a helping hand, a kind word or a hug. Students in classrooms can learn to recognize this and become more empathetic. It doesn’t take much. By encouraging and recognizing small acts of kindness, even the importance of greeting people, acknowledging people by name, and asking how we can be of assistance to each other are all fundamental to acts that matter. I can attest that the real power of accepting help is realizing just how many caring people exist all around us. Allowing myself to accept help has enabled me to be more sensitive, empathetic and thoughtful as an educator and a dad. I am eager to pass on this healing gift.